The Smart Series provides operators of professional laundry facilities of all sizes – from OPLs to industrial laundries – with a package of reliable, flexible solutions for precise, consistent chemical dosing. Covering washer-extractors and tunnel washers from 25kg to 100kg, the Smart Series pumps can dose up to three chemicals simultaneously, with the option of fixed or selectable flow rates. 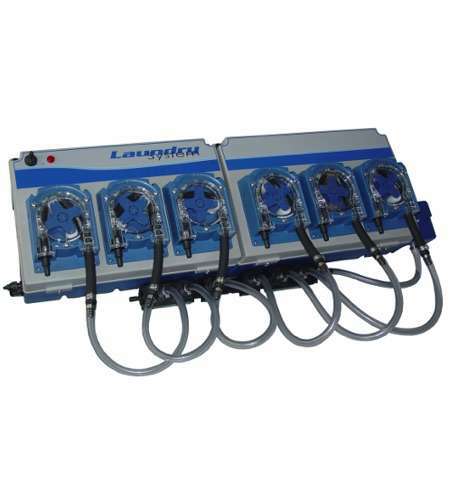 The Smart Series is capable of serving 2 – 7-pump systems with as many as 20 wash formulas, providing excellent chemical compatibility courtesy of high-grade Santoprene and neoprene tubing. The dedicated Smart Spring controller and Smart Programmer complete the Smart Series range for a packaged professional laundry solution that provides total dosing management.